How an Australian blogging beginner and Innocent smoothies just confirmed how cool the web is for me. I've had two reactions to this story today. One was "Welcome to the 21st Century" and the other was "Well that would mean a lot more to you than me". And both are true. But it has me smiling! One of them is reading the innocent drinks blog daily. Dan, Ted and the others in Fruit Towers write really well and they've got a great community website - a fantastic example of how to do things properly online! Anyways, today Dan at Innocent introduced us to Olive Riley. In her own words "My name is Olive Riley. I live in Australia near Sydney. I was born in Broken Hill on Oct. 20th 1899." Olive is 107. And she has started a blog called The Life of Riley. She dictates to her helper Mike who types her blog. They've only started but they have visitors from Poland, Germany, The Netherlands, Spain, Texas, India... and Dublin. I find it remarkable and inspiring. How wonderful is the interweb for bringing us something like that? What I really got a kick out of was when I posted a comment on her blog today, I got an email from Mike - yes, that Mike - asking for more information. 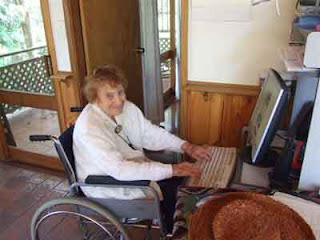 So you've got a 107 year old Australian Lady and Mike her helper blogging, Dan in London blogging about Olive, me in Dublin reading Dan's blog, posting and then hearing from Mike the helper same day. The internet is just cool! Or maybe as Niamh kindly pointed out this morning - I'm just easily impressed. Is editing websites, making sure the spelling and grammar is correct and reads well, actually necessary? People to my mammy: "What does Darragh do?" My mammy: "Ah we works with computers in Dublin. Beyond that I don't know..."
It's funny how I fell into being a Web editor. Like my previous post, it's all about criticising (correcting) the work people do trying to improve it, in a nice way. But do I need to do what I do? I don't know if it's the January or February newsletter. But at the end of the day, does it actually matter? Now it's very easy for me to sit on my ivory tower and find things wrong on the web. The IIA does a very important job in this country on a miniscule budget with very few staff and practically no Government support that I know of, and so I'm delighted to see they're getting their website updated. I'm sorry but it IS the Internet Association of Ireland and yet on their website in 2007, part of its vision, including Internet EXCELLENCE is the phrase that their (very worthy) goals "are to be achieved by 2005. " So the fact it's been changed is a very good thing indeed. With txt spk, Cambridge Researchers and Bebo (have you read/deciphered some of the comments? ), will I soon be out of a job? Surely the web community in Ireland should support the IIA and say - well my contribution is going to be... design/ programming/ copywriting/ editing or whatever it is people do. Wouldn't a site representing the Irish Internet Community which features contributions and showcases the best of the talent out there be a good thing? As I said, it's easy for me to crtiticise, but wasn't it up to me as much as anyone to make a change? So this morning I emailed Fergal at the IIA and offered my copywriting/proof-reading skills for the new website when launched. He responded grateful for the offer. So there's a new project for me - one I think I'll enjoy! Could having the courage to say something instead of nothing result in a better online experience for people? Yes you're doing it to improve the ultimate project - Seth Godin refers to us as tweakers - but still someone's put a lot of hard work into a project (at times!) and here you are criticising it. It's all about how you phrase something and communicate your idea, no matter how absurd or petty it seems I guess. You'd be surprised by how many times I've been given this book. Is editing a valid job? I mean after all, we've all read (and been forwarded) the Cambridge research that it deosn't mttaer in waht oredr the ltteers in a wrod are, the olny iprmoetnt tihng is taht the frist and lsat ltteer be at the rghit pclae. The rset can be a toatl mses and you can sitll raed it wouthit porbelm. Lovely. So much for paying attention in English class! I've worked with the crew at St Patrick's Festival for three or four years, doing general volunteer work - skyfest marshalling, walking with the Parade, the Denny's Treasure Hunt ... really good fun. I have a lot of respect for what they do. They put a huge amount of effort in and it's a great time for Ireland. I was in London last year but volunteered for 2007. I mean on the one hand I'm not employed by them, and the email may have been sent by a junior volunteer with a hundred million things to do... but on the other hand it did have my email address there as plain as day for anyone to read/copy/spam. Jonathan Jensen over at Sevendotzero recently posted about the same thing. Now it may not have been my advice or anything, but still, it could have been, and it looks more professional. The end project is a little better. I smiled anyhows. If anyone can help the festival out, please do so. You'll have fun, guaranteed! Way back in the hey day of the Celtic Tiger Irish Internet boom, websites and web companies were springing up like shamrocks. I was lucky enough to start work in 2000 with a "revolutionary website, a one stop shop for all your internet needs, a site and product for everyone that would change the internet in Ireland forever". There was a huge launch, a huge budget, a huge buzz about it. I remember offices in Citywest with 98 people in different teams, all working on this project. It failed. Certain people may disagree, but how many people are sending their emails through their TV now? There's no denying it was a great idea, and a lot of talented people worked on it but ultimately the execution failed. Personally, I had a great passion about it but couldn't do much about the ultimate cause... what was to become the disintegration of the Irish Internet Industry. Very few .coms/.ie's that began then are still operating. Certainly it's only those with good business models who ran their business well, with the support of good staff have prospered. However I digress. One of the first international .com bombs was the demise of Boo.com, an online fashion retailer (a one stop shop for everything you need...). I remember hearing about it at the time. The founders had called it 'a totally new concept in online shopping'. Its failure certainly ruffled a few feathers. Being the geek I am, I was recently given the book Boo Hoo, A Dot Com Story and this documented boo's downfall. Fascinating read. Basically as the Wikipedia article, the recent posts in blogs and the book says, it was a good idea badly executed. Terribly badly. $135million in 18 months badly. And now, apparently, it's coming back and the domain is registered to an Irish user. I've never been one for online fashion buying - even if I could earn PiggyPoints from Curly for buying them from ASOS.com, so it may not affect me too much, but what they've done on their (coming soon) homepage is create a slider which could very well be how this internet 2.0 should be. Basically it's a slider that changes what I see based on where I feel the slider should be. So if the slider represents me and the content is what changes... well that's interesting. Not necessarily new, but interesting. "Say what you like, love what you find." One of the big problems I personally have with most websites is that they don't really care about ME. Gerry McGovern writes about seeing your reader, not a user, and most web 2.0 companies who are successful are trying to personalise their sites to the nth degree. That's why this new boo (boo 2.0?) may be on to something. Think Bebo, Flickr, Moo Cards, Last.fm, Google's personalised Homepage (and the cooler Netvibes) - all offering a more personal browsing experience. It's what I want on my screen. Seth Godin has posted about a more personal integrated experience as part of Web4. The new boo could be offering that. If I can truly say (or choose) what I like and so I'll love what I find, I'm sold already. At the moment I'm far more Overture than Overdrive (with one notable exception) and so the idea that my browsing experience will be based not on what the website thinks I am, but who I really am appeals to me. Personalisation is huge. Look at the amount of Bebo accounts with photos, movies, backgrounds, out there. Similiarly photos on Flickr, videos on You Tube. People will take the time to get what they want. Amazon kinda does it well - it suggests books/DVDs that other people have chosen - but I may not be interested. The books that are on special offer though grab my attention. I'm not sure what this new Boo will be. Fashion? Food? Music? Their landing page gives no firm clue, but if they offer me the chance to get what I want based on who I'm telling them I am, rather than putting me into one of their categories or suggesting it, well that'll be cool. And so I add my voice to the others who wait (blog) with bated breath to see what this new boo will be. No matter how huge the budget, how fashionable the clothes, how cool the technology or how nice the site, they have to remember there's a person on the other end of the screen trying to find what they want quickly and easily. Make me love what I find. Ooops - it can happen to anyone! I love this Valentine's post on Seth Godin's blog. It pretty much speaks for itself. It's nice (but scary) to think that even the biggest players in the world can make a mistake (or be accused of one). I can think of no better way to kick this off than by publishing/sharing this You Tube video from Professor Michael Wesch, of Kansas State University. This more than anything I've seen before reignitied my passion for the Internet, has been viewed by millions and embedded on every Internet Geek blog from here to Timbuktu. Enjoy.